The CRR Gold Circuit is a set of 20 rides and ride types that we are encouraging all members to attempt in 2019. If you finish the full 20 rides then your name will be on the upper back of the CRR Circuit t-shirt, which you can purchase after the season ends. If you finish 10-19 rides of the 20, then you qualify as a silver-circuit rider and your name will be on the lower back of the t-shirt. This is a fun way to get more people riding with different groups and leaders, as well as exploring some new routes and rides. You will see that the list includes recurring CRR rides, as well as a few various other rides to explore. Some of the 20 include multiple possibilities, of which you only need to do one for circuit qualification.
. Must support silver circuit scenario where at least 10 of the 20 rides will be no more than 45 miles. If you can not make a ride due to ongoing scheduling conflicts (e.g. you work on Tuesdays and can't skip for a ride), then please ask the usual ride leader to schedule a weekend version. If the usual ride leader is unable to do so, then at that point you can feel free to call the ride out yourself (or have someone do so), and replicate the route that normally occurs. When filling out the ride sheet, the ride leader will be able to designate which of the 20 categories (if any) the ride fits into. Of course, we also ask that ride leaders indicate this when calling out their rides. 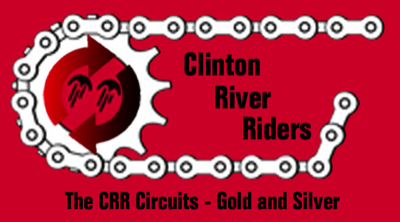 The CRR Circuit is cooperative riding. Helping each other get out there and onto the t-shirt is the goal... names will be alphabetical. Who knows.. maybe there will be an award for the person who gets the most people out there. More details can be found on the CRR Calendar when the rides are called out or scheduled. We are looking for the usual ride leaders to indicate start location, pace, distance, terrain, area of the ride, and usual stops and we can update this list accordingly. ~20 miles, ~15mph pace (no drop), led by Kim or Craig along the Metro Freedom Trail and into Lake St Clair Metropark, starting at Great Lakes Family Dining at 16 Mile and Harper. Asphalt trail and some roads, flat terrain, at least one rest stop at the Metro park and usually optional dinner afterward at the start/end location. ~32 miles, ~17mph pace (regroups), led by Sandro or John, along Jefferson from SCS Memorial Park to GP Windmill Point. All paved road with one stop at Windmill Point and sometimes dinner afterward. ~35-45 miles, ~15-17mph pace, generally flat terrain, led by Rick and Sue on Thursday mornings. Starting point varies week to week as does the destination of the ride. Ride generally starts in Macomb County or Southern St Clair County. Ride in the Grosse Points, Mt Clemens, Harsen's Island, Marine City, St Clair, Richmond, and Memphis. Most rides include a brunch stop. We will provide starting time, location, and destination via the CRR Email list. ~35-55 miles, ~15-17mph pace, led by Rick and Sue. ~35-45 miles, ~15-17mph pace, moderately hilly terrain (1200 ft of climbing when heading South, and up to 220 ft of climnbing when we head North and West), Tuesday mornings. Meet in the Southwest corner of Sheffield Office Park parking lot, located in the Northwest corner of the intersection of Big Beaver Rd and Coolidge, west of Cunningham Dr. Enter the parking lot from Big Beaver. Ride in Troy, Auburn Hills, Bloomfield, West Bloomfield, Orchard Lake, Franklin, Southfield, Beverly Hills, and Birmingham... to name a few. The destination will vary week to week. There is usually a brunch stop during this ride. ~40-55 miles, ~15-17mph pace, moderately hilly terrain (1500-2300 ft of climbing), Tuesday mornings. Meeting in River Bends Park, using the entrance on 22 Mile Rd, just beyond the railroad tracks, West of Shelby Rd. Ride in Shelby, Rochester, and Auburn Hills. There is usually a brunch stop during the ride, somewhere around Oakland University. ~48 miles, ~16mph, led by Craig or Kim, along the Metro Freedom Trail to Dodge Park and into River Bends Park, starting at Great Lakes Family Dining at 16 Mile and Harper. Asphalt trail and some road crossings, flat terrain with some quick steep hills under and over bridges in the parks. Rest stops as requested. Optional dinner afterward at the start/end location. ~50-100 miles, group pace, led by various ride leaders. Can either pick any CRR Century ride, or a CRR led group at an invitational ride such as the Midwest Tandem Rally, or a CRR led group at a charity ride such as BikeMS, Mind Over Matter, etc. Variable distance and pace and ride leaders. Pick one and ride with a CRR led group. Many thanks to our invaluable SPONSORS!